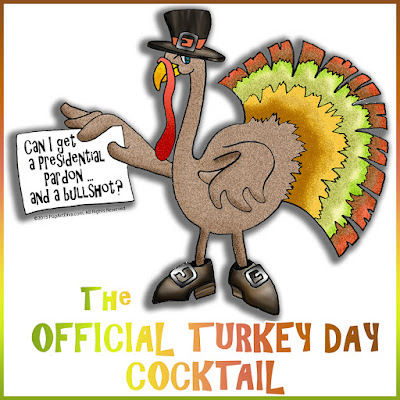 Don't freak out - I didn't stuff a turkey in a martini glass! I tried, it just wouldn't fit, so I did the next best thing .... Since I first started creating cocktail recipes I wanted to create a martini inspired by a traditional Thanksgiving dinner but all I could conjure up in my head was a glass of turkey gravy garnished with a twist of browned turkey skin. I'd shudder and go back to the Thanksgiving dessert table for my holiday inspiration. Then, when I was making bone broth from my turkey carcass last Thanksgiving suddenly a light bulb went on over my head. I could make a Bullshot using turkey broth instead of beef and put Thanksgiving dinner on the cocktail pick! A Bullshot is a cocktail made with beef broth and vodka, it was a popular drink at brunch back in the days of the fern bars. I hadn't thought of a Bullshot in years, they went out of fashion about the time the fern bars disappeared, but once the memory floated up to my conscious brain I realized it would be a great inspiration for my "turkey" martini. Instead of a gravy martini I could do a broth martini! INGREDIENTS 1-1/2 Oz. Bacon Vodka 2 Oz. Hot or Chilled Chicken Broth (or Bouillon) 1/4 Tsp. Worcestershire Sauce Rim Ingredients: 2 Tbsp. Kosher Salt and 1 Tsp. Poultry Seasoning Garnish: Cooked Turkey, Pickled Green Bean, Baked Yam, Dried Cranberries, Croutons on a cocktail pick. DIRECTIONS Rim your chosen glass or mug. CHILLED: Add ingredients to an ice filled cocktail shaker and shake until chilled. Strain into your glass, garnish and serve. HOT: Add the bacon vodka and Worcestershire Sauce to your mug then pour in the hot bone broth. Garnish and serve. When you finish your Turkey Day Dinner Cocktail, you can slide right into the Pumpkin Cocktails for dessert.